It's A Dan's World: YOU HAD ME AT BRAINIAC: Is A New Superman Film Up, Up, And Away? YOU HAD ME AT BRAINIAC: Is A New Superman Film Up, Up, And Away? It's the war of the websites; Latino Review broke the 'news' that David Goyer (Batman Begins) had been hired to screenwrite a new Superman movie titled The Man Of Steel. Respected movie site Variety had their back, until Aintitcool.com stepped into the ring, saying David isn't a lock, while Warner Bros., DC, and David himself stayed 'mum'. The best tidbit from L.R? 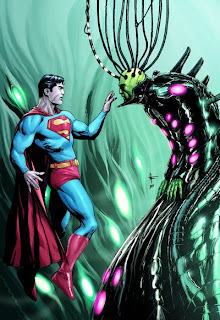 "I can tell you that Goyer's story involves Luthor and Brainiac. It is NOT an origin and assumes audiences already know about Lois, Clark, Jimmy and Perry. I know the Daily Planet is struggling due to the internet. And I know it sets up a huge Kryptonian mythology." 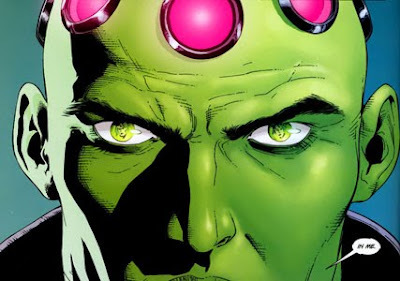 Brainiac?! The Kryptonian's overlooked 'other' top rogue, could finally be getting his shot at Hollywood. If this one point alone turns out to be true, DC can consider my ticket already sold.